The Prompter People Proline 24" Widescreen Teleprompter is a versatile teleprompter system that works with cameras ranging in size from small consumer camcorders to large ENG cameras. It features a 24" 60/40 beamsplitter glass and a 1920 x 1080 LCD monitor with HDMI, VGA and DVI Inputs. You can flip the image on each input via a menu function. The 60/40 glass provides bright readable text without stealing excessive light from the image. This allows to be readable up to 30 feet away from the talent. The beamsplitter is large enough that it can be used as a conference system giving you direct eye contact, or allow a large audience to view the presentation. The Monitor can also be used as a production monitor by taking a signal over its HDMI connector. The included Flip-Q Pro teleprompter software runs on Mac and Windows and allows you to create, control and mirror image your prompting script for proper display on the prompter. Available accessories include a wireless remote controller and a foot pedal (PC only). 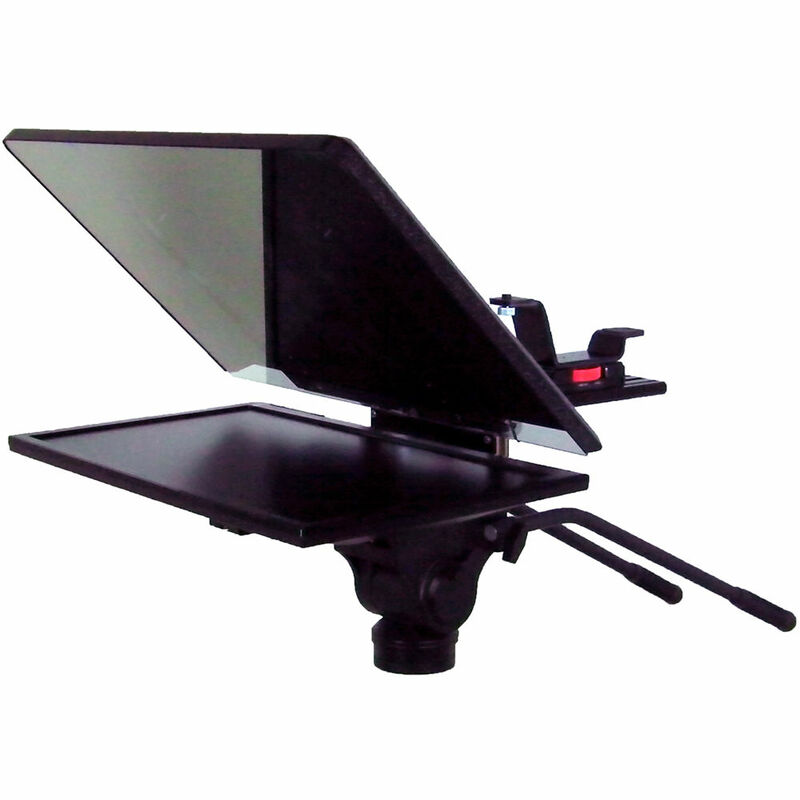 Thanks to its variable height adjustment, the prompter accommodates virtually any camera, and the angle adjustments compensate for the distance from talent for a comfortable prompting session. The prompter features tool-less set-up and you can fold it up for storage without having to disassemble it, which makes it fast to set up and fast to put away. The beamsplitter is a studio quality 24" 60/40 glass that that allows direct eye contact conferencing or viewing by a group of people. Featuring HDMI, VGA, DVI the monitor can also be used as a production monitor when not being used as the text source for the prompter. Height adjustments allow you to center virtually any camera. A menu driven reversing function allows you to flip the video from any of the inputs, so you don't need an external image flip device. Box Dimensions (LxWxH) 36.0 x 24.0 x 21.0"
Proline 24" Widescreen Teleprompter (Standard Model) is rated 3.0 out of 5 by 1. Rated 3 out of 5 by Sture from Decent, but not accurate description We use the product in a professional studio for recording Powerpoint presentations. First of all the specs says 2 HDMI, but in reality there is only 1 HDMI. Specs says 1 DVI, but there is none. There is however a TV connection so I guess this is TV monitor originally. The included monitor manual is not relevant for this monitor, seems like it as an old one for smaller monitors. I think you can only use this mirrored despite what the specs say. The beamsplitter glass seem to be mounted by some sort of plastic tape which do not seem to be fastened everywhere - hope the glass will not fall out. Finally the 4 nuts behind the glass are chromed, which makes them seen for the talent, they could easily have used black nuts instead for a few cents more. To me it seem like a manufacturer who do no really care about their products. I guess we could have returned if they freight was not so extremely expensive. On the positive note however it works as a decent teleprompter.